ClockWatch is a time sync application developed by Beagle Software. ClockWatch has been verified to work with SocksCap. SOCKS was owned by Permeo, which was bought by BlueCoat (www.bluecoat.com). Beagle Software test configuration used WinProxy as a proxy server. 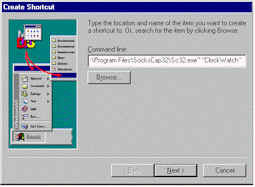 SocksCap is a Microsoft Windows DLL that extends the functionality of the Windows Socket (Winsock) stack, allowing it to work successfully in the SOCKS5 environment. SocksCap intercepts calls from Winsock applications to the Windows Socket (Winsock) stack and converts them to calls that support SOCKS protocols. SocksCap resides between non-SOCKSified Winsock applications and a non-SOCKSified Winsock stack. It converts socket calls to communicate through a SOCKS V4 or SOCKSv5 server. You can configure SocksCap to connect directly (not through the SOCKS server) to some addresses and to use proxy connections (through the SOCKS server) to all others. Users behind corporate proxy firewalls that are SOCKS-capable. Users running SOCKS servers or SOCKS daemons that serve as firewalls. How can I get SocksCap? Start SocksCap from the Program menu. Select Setup from the File menu in SocksCap. 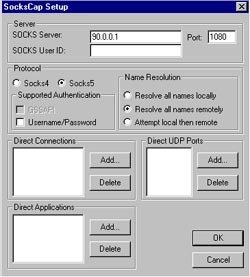 SOCKS Server: The IP address of the proxy server running SOCKETS. SOCKS Port: The port the SOCKS Protocol is using (typically 1080). Name Resolution: Resolve all names remotely. Leave the default settings remaining fields. Click on New in the SocksCap main window to create an application profile. The profile name and working directory will be filled in automatically. Click OK to save the ClockWatch profile. Create a shortcut to run ClockWatch with the SocksCap wrapper. From the Windows desktop choose New->Shortcut. Find the SocksCap32 executable and add the profile name, "ClockWatch" as an argument. Give the shortcut a descriptive name such as SocksCap ClockWatch.